Leicester climbed to third in the Premiership table after hanging on for a narrow win over Bath on a foul afternoon at rain-lashed Welford Road. England prop Dan Cole claimed the try which clinched it six minutes from time just after Bath were reduced to 14 men. Tigers defied the weather to fight back from a try by England's in-form Anthony Watson as they led 11-5 at the break. 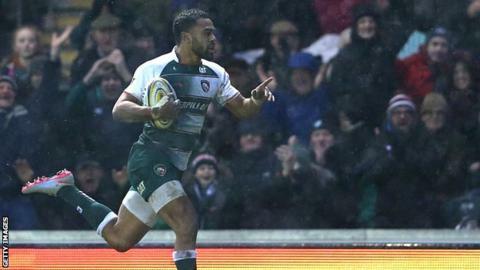 But the highlight of the game was Leicester left winger Telusa Veainu's stunning 80-metre interception try. Tommy Bell failed with his conversion but did improve Cole's try, as well as also landing three out of five penalty attempts in difficult kicking conditions, while England stand-off George Ford slotted two penalties. Both sides had to contend with savage conditions, driving wind and rain almost throughout. Kicking at goal was not easy, which may have accounted for the visitors' late decision to squander a kickable penalty, and a possible losing bonus point, by opting to kick for the corner. But they had been hampered by the loss of sin-binned debutant David Denton for the last eight minutes - just seven minutes after coming off the bench. Two minutes after his yellow card, following more Bath indiscipline at a driving line-out, Cole crashed over for the clinching try - the 28-year-old 56-times capped England man's first try in 78 appearances. Bath have not won at Welford Road in the Premiership since 2003 - but they made a bright start when, following the loss of injured home full-back Matthew Tait after a first-minute tackle, a rapid break created the space for lively full-back Watson to go in at the left corner. Ford missed with his kick from the left touchline before Bell was more successful with his first penalty attempt. Then came the game's highlight, when Veainu intercepted prop Nick Auterac's pass before galloping down the left to score. Bell again missed the kick but was then successful with a penalty attempt to earn an 11-5 lead at the interval. Bath, however, failed to cash in on their man advantage. Bell's next penalty attempt fell short and wide before he did finally land a third three-pointer to put his side 14-11 up. And no sooner than Bath had been reduced to 14 men following Denton's yellow card than the Tigers struck. A video verdict ruled that Cole had managed to keep hold of the ball and ground correctly, allowing Bell to add the extras. "I am delighted for the players that they found a way to win because we played pretty poorly at times. But our guts, attitude and trust got us over the finishing line. "Dan Cole probably came back from the World Cup with a dent to his confidence. He's had a bit of criticism but there's always speed bumps along the way in life. But Leicester is the place to come back to. "We just got on with it and the lads took the mickey out of him. Coley is back among friends. He's a man of few words who likes to work his way through it in his own way and he has done that very well. "Coley is not that old. He's got a lot of rugby left in him. He has been the standard at tight head for four or five years. There are young guys coming through but he will get better as time goes on." "We are better than we showed here. I was disappointed to go in at half time losing. We were the better side. The interception was a turning point. "We got back to 11-11 and had great possession and position to take the game by the scruff of the neck. We never took those opportunities." "We will analyse it on Monday but the call was to go for goal. Leicester Tigers: Tait; Thompstone, Betham, Smith, Veainu; Bell, B Youngs; Ayerza, T Youngs, Cole, Slater, Fitzgerald, Williams, O'Connor, McCaffrey. Replacements: Catchpole for Tait (1), Harrison for B Youngs (48), Croft for McCaffrey (57), Bai for Catchpole (65), Bateman for T Youngs (76), Aguero for Ayerza (78), Balmain for Cole (78). Bath: Watson; Rokoduguni, Banahan, Eastmond, Agulla; Ford, Matawalu; Auterac, Batty, Thomas, Hooper, Ellis, Garvey, Louw, Houston. Replacements: Cook for Matawalu (54), Catt for Auterac (60), Lahiff for Thomas (61), Dunn for Batty (65), Denton for Ellis (65), Priestland for Eastmond (69), Homer for Agulla (69).